Defending champion Novak Djokovic thrashed David Ferrer to reach the Australian Open final and stay on course for a hat-trick of Melbourne titles. Djokovic had too much pace on the ground and off his strings for the Spaniard, winning 6-2 6-2 6-1 in one hour and 29 minutes. "The Spaniard tried as hard as he could but Djokovic made him look average. It fully justifies his listing as the favourite for the Australian Open. He lost only seven points on his serve and converted seven out of seven break points. And, at an hour-and-a-half, the match was significantly shorter than last year's semi-final against Andy Murray, which lasted almost five hours." "I played incredible tennis," he said. "I felt very confident and comfortable from the start. It was definitely one of the best performances I ever had in my career." It was in marked contrast to last year's semi-final, when the Serbian had needed nearly five hours to see off Andy Murray. Djokovic went on to win his third Australian title in 2012, and this year is trying to become the first man since the Open era began in 1968 to win it three times in a row. He can now enjoy a 48-hour rest until Sunday's final, awaiting the outcome of Friday's second semi-final between Murray and Roger Federer. Ferrer had matched his seeding of fourth by making the semi-finals, and had five wins over Djokovic to draw hope from, but he never threatened an upset. A more telling statistic was that in 14 meetings between the two, Ferrer had never won a match on outdoor hard courts. Djokovic, 25, has become the man to beat at Melbourne Park in recent years and, after a quiet start, he made his move in game five. A forehand ripped down the line and a volley into a gaping space he had created brought him break point, and a Ferrer error handed it over. The top seed moved 5-2 clear thanks to some typically athletic defence and a deep return, and closed out the set after 29 minutes. Things got no better for Ferrer in the second and within 20 minutes he was again down a double-break, this time throwing in a double-fault to fall 4-1 behind. Ferrer, 30, was as game as ever, muscling the ball back but without being able to hurt the world number one, who broke for the fifth time at the start of the third set. Ferrer trooped back to his chair disconsolately, and moments later a rare winner for the Spaniard drew a huge cheer from 15,000 spectators craving a contest. They had to settle instead for a champion in full flow, Djokovic breaking yet again - this time to love - with a couple of screaming winners for 3-0. The beaten Ferrer admitted of the demolition job: "He play very, very good. I didn't have any chance to win tonight. All can I say is Novak was better in every moment than me." 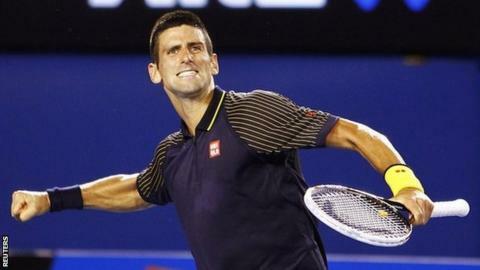 Djokovic added: "It can only do positive things to my confidence. Definitely at this stage of a tournament, playing semi-finals against the world number four, somebody that I have respect for, great competitor, and being able to perform as well as I did, it's incredible. "I have a great feeling about myself on the court at this moment. Now I have two days off before the finals which gives me enough time to get ready, you know, and recover." Murray v Lendl - who would win? Read more on Andy Murray v Ivan Lendl: who would win, Briton or his coach?